Watch Bones Season 8 Episode 15 online via TV Fanatic with over 8 options to watch the Bones S8E15 full episode. Affiliates with free and paid streaming include Amazon, iTunes, Vudu, YouTube Purchase, Google Play, Hulu Plus, Amazon Prime, and Verizon On Demand. While working late in the lab, Brennan is shot on Bones. While in and out of consciousness, Brennan has conversations with her late mother. Bones: I have to get back. I have a daughter. Christine: I know how you feel. Once I had to leave my daughter behind too. I'm pretty sure it killed me. [to Bones] You are still the most stubborn creature on God's green earth. Permalink: You are still the most stubborn creature on God's green earth. 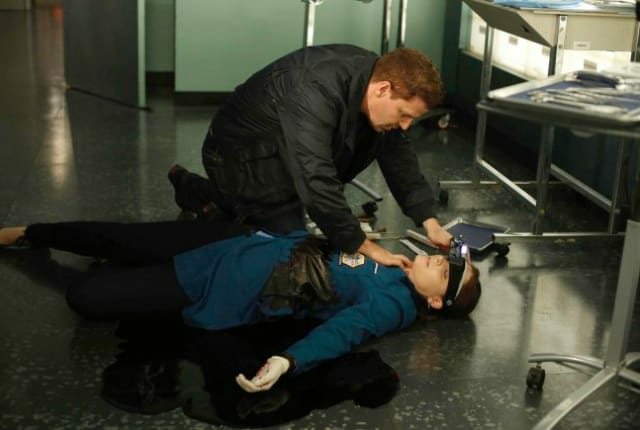 Bones Episode Preview: Who Shot Brennan?